Paul Ryan's budget balancing act. Rep. Paul Ryan (R-WI), Chairman of the House Budget Committee, joins with other members of the committee as he departs a press conference at the U.S. Capitol where he unveiled his budget plan on March 12, 2013 in Washington, DC. I lurked around the Hill yesterday, watching Rep. Paul Ryan unveil his somewhat new budget—balanced in 10 years!—and talking to Democrats about its contents. The story that came out of this is about the meaning of balance. Why did Ryan seek to hit that target, rather than explaining how much the average tax payer would pay, or get from government, to hit it? Ponnuru should know; he was one of the speakers at that retreat. He’s happy with much of the new Ryan budget—“it’s great that they’re still standing for Medicare premium support”—but wonders whether they focused on the wrong numbers. Why be so specific about when the budget will balance, but not about how? Well, one reason is to get headlines about how you’re going to balance the budget. Every voter, theoretically, likes balancing the budget? But the rare credulous headlines have come from partisan news outlets have been accompanied by incredulous interviews from people who largely agree with Ryan. LARRY KUDLOW: You’ve got a 10-year balanced budget. How much of that comes from repealing– Obamacare? What do you make on that? LARRY KUDLOW: But in terms of your budget, it – if you don’t get it this year, the likelihood of getting repealed this year is very, very, very low. Does it blow a hole in your 10-year budget? 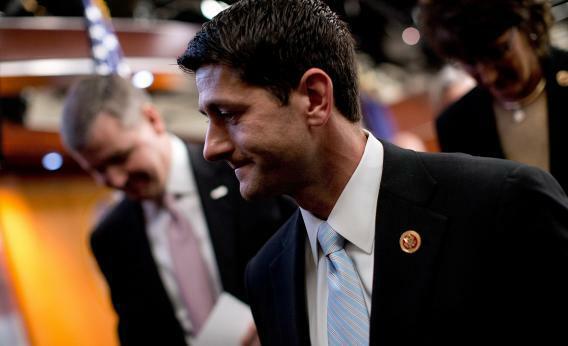 PAUL RYAN: Sure, it blows a hole in your budget, because it’s– it calls for continuing the spending. But what is a budget? A budget is our vision for how we should fix this country’s fiscal problems. See how quickly he gets existential about it.